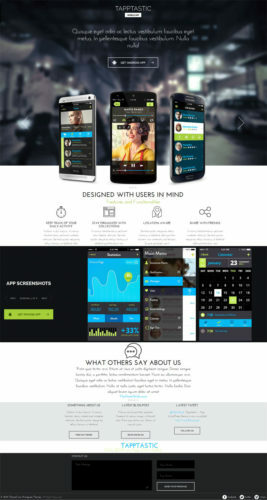 Tapptastic is a responsive mobile app Wordpress Theme by Themefuse. Mobile app developers are finally able to promote their iPhone, iPad or Android apps with this mobile Wordpress theme that has all the features in place to do that in a creative way. The theme features a scrolling gallery with animations, testimonials, easily upload videos, play videos in the scrolling gallery, social media icons, flat design and more. Click here to see more features of Tapptastic Wordpress Theme. Tapptastic is a responsive theme perfect for users to view your website on their smartphones and tablets. The screen with automatically resize to fit the width of the viewing area. Mobile App Theme has 4 beautiful iconic boxes to showoff your best mobile application features or display other services. Also with the attractive call to action buttons will produce high conversion of traffic.